With more teams adopting CI and CD practices, running automated tests and checks during these builds is a natural next step in ensuring the quality of an API or web application. In this post we'll look at how integrating Assertible with a TeamCity build makes it easy to catch and react to failures in your software. TeamCity is a popular and powerful continuous integration and delivery tool created by JetBrains. It contains powerful out-of-the-box features that make it easy for anyone to set up an enterprise-level CI pipeline. Psst! Assertible is free to use. If you don't already have an account, sign up here . If you're already set up with Assertible, skip down to configuring TeamCity below. Assertible makes it easy to create automated tests for your API, web application, or website. These checks help validate that your web service is working as expected. All you need to get started is a URL, Swagger/OpenAPI specification, Postman collectionn, or a curl command. For more info, check out the Getting Started section of the documentation. The tests for this API will run tests and checks that will validate the status code, response headers, and response body of the various endpoints. Assertible has many more types of checks you can make too, too - check out the assertion documentation. Just like unit tests, we want to run the Assertible integration and functionality checks before the new application is deployed. This allows for a comprehensive set of validations to be run before the changes make it to any users. Push code and initiate a build normally. Add build step to run the application under an ngrok proxy. 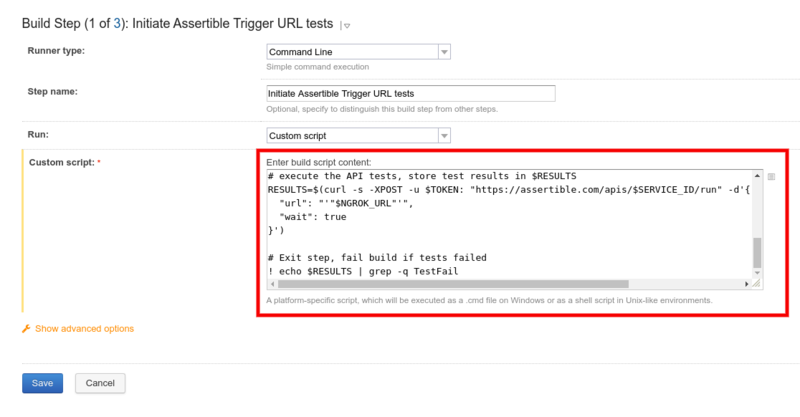 Initiate tests and checks with the Trigger URL. Continue with deploying the application. I'll cover this process more thoroughly below, but for now all you need to know is that your Trigger URL can be found on the Settings tab of a web service in Assertible and all of the available Trigger options can be found here. Deploy your application to an environment (production, staging, etc). After the deployment, call the Deployments API to test the new release. Post-deployment testing is something that has, so far, been unique to large organizations with the time and resources to set up their own test automation. At Assertible, we created the Deployments API to allow any team to easily start using this valuable process. A sample Deployments API script can be found on the Deployments tab of every web service in Assertible. More on that below. Now that you've created tests and checks for your web application and have a good understanding of the ideal process, let's look at integrating these tests into a TeamCity build. For brevity, I'll skip actually installing and configuring TeamCity, but they have great docs on that process. The basic idea is that after the application has been built in CI, but before it has been deployed, we can run a series of tests on the application to ensure that the new changes are working as expected. To use the Trigger URL you only need to run a single command. Choose the Command Line runner type when configuring the step. And be sure to select the correct type of step depending on your environment, Linux or Windows. The last line is particularly important. It will fail the TeamCity build if any API tests fail to prevent a faulty application from being deployed. This script is just to serve as an example and can be modified for your specific use-case. And there you have it: pre-deployment integration tests for your web service run within a TeamCity build that will fail and alert your team if any checks don't pass. Next, let's look at how to test an application after it has been deployed. Now you want to run tests and checks against your application after it has been deployed to verify that everything is working correctly. To do this you can use the Deployments API from Assertible. As new changes are released to production, staging, or any other environment, it becomes time consuming to test things manually - let's automate that away. Like the Trigger URL example above, the new build step simply needs to use a basic command line configuration. Choose the correct type of step depending on your environment, Linux or Windows. When you call the Deployments API Assertible stores the information about the release and runs tests against the new version. The release history of your application, along with the status of the tests, can the be viewed in the Assertible dashboard for an easy way to track regressions in your API. There are several options available when calling the Deployments API that allow you to specify the environment, the VCS ref, version number, and much more. Check out some more examples here. Next I'll show you where to find and inspect your test results in Assertible. 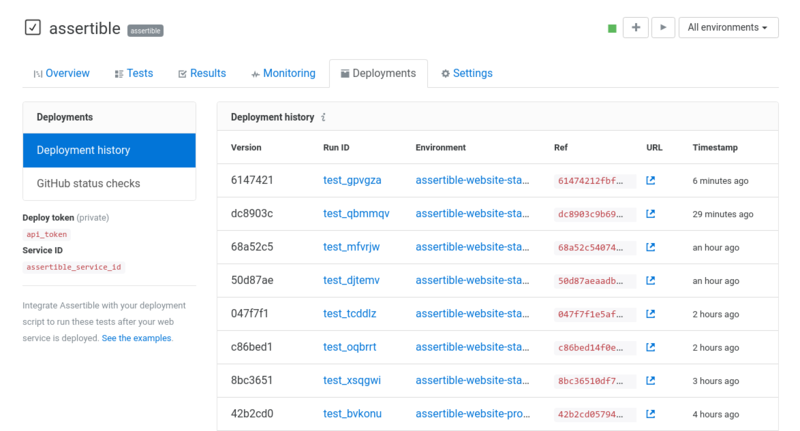 Now that your TeamCity build is configured to run Assertible tests against the application pre- and post-deployment, let's look back at the Assertible dasboard for the viewing the full test results. More information and examples on viewing test results are in the docs here. Email hooks allow you to receive a notification when you tests fail, or every time they are run. You can also integrate Assertible with Zapier to trigger a flow every time your tests are run. 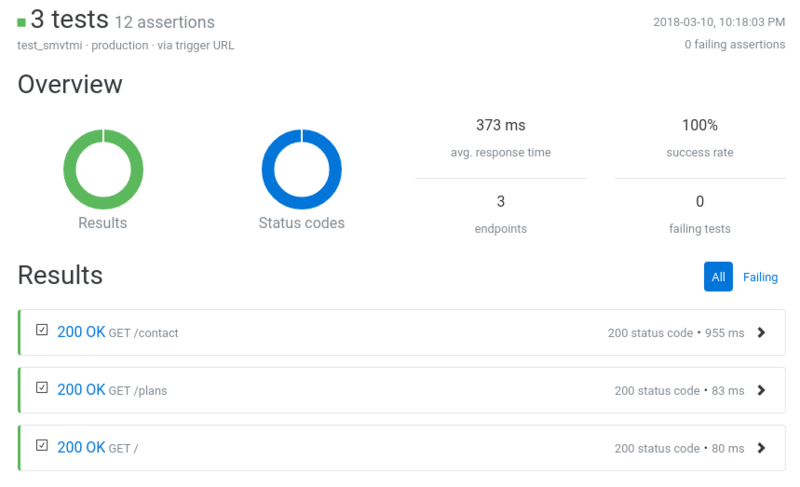 This allows you to do almost anything you want with your results, like sending them to an issue tracker, logging them with webhooks, and more. 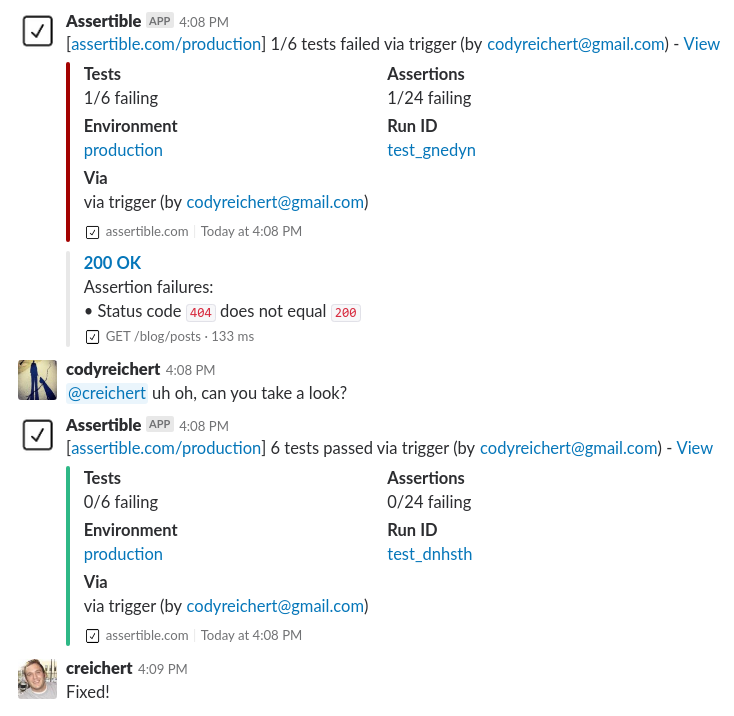 The most popular way of receiving alerts about your tests is with the Slack integration. This integration allows you to send a message to a channel when tests pass and/or fail. Slack notifications are ideal for teams where multiple people are in charge of responding to web service failures. 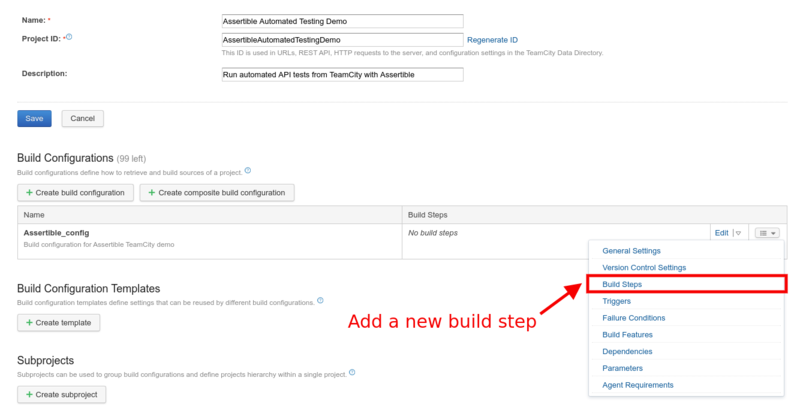 With Assertible it's easy to add automated API or web application testing to your TeamCity builds. This provides another valuable layer in ensuring the quality of your application and reduces the time required to make manual checks on new changes. Have any questions or comments? I'd love to hear it! Let's chat on on Twitter or reach out to me directly, I'd love to hear from you!